Brunch: a midday tradition of lackadaisically eating breakfast-like foods usually accompanied with booze. A pretty solid deal considering a staple of this meal is getting buzzed in the early afternoon. Brunch is a tradition that has lost some of its previous prestige and popularity. Maybe the decrease in practicing brunch is due to the booze involved, which is typically mimosas or bellinis because they are based in an orange or peach juice. Traditions are traditions because they are practiced over and over again, generally accepted and liked by participants. But sometimes it is more fun to break traditions and brunch is where I want to start. So at your next brunch skip the fizzy fruit cocktails and drink craft beer. At first I was a little skeptical too about this drastic switch but it makes complete sense. Craft beer is getting into the food scene more and more with new brewpubs opening all over the country and innovations in creative brewing. Food and beer pairing is a new practice that is gaining traction, so why not with brunch? Maybe with a new twist on the brunch concept more people will partake. I agree that beer can be paired with all meals and so I did some thinking and some research on the concept of a beer brunch and came up with some interesting ideas on how to put one on for yourself. The biggest idea to keep in mind is finding flavors in the beers that will accent the flavors in the menu. Wheat beers are a great place to start for brunch. A German hefeweizen or Belgian witbier pair well with eggs- the main star of any brunch. The fizz of the beer compliments the soft or gooey texture of egg dishes and the malt and bread-sweet flavor of these beers offer a counterpart to salty breakfast meats. These beers are light and are easy to drink without sacrificing flavor. If you are still on the fence about swapping the champagne with beer this could be a good start for you. Hey, you could even put an orange or lemon slice on the side of your hefe pint glass and ease your way into this change. The only word of caution I would advise is watch out for IPAs. I enjoy a good hopped beer but sometimes these flavors could overpower the hard work you put into the food portion of your brunch. A fruity IPA would go well with brunch, like a grapefruit IPA or even one of the many great beers made with the Cascade hop because it is citrusy in flavor and gives a bright burst of flavor to the beer. 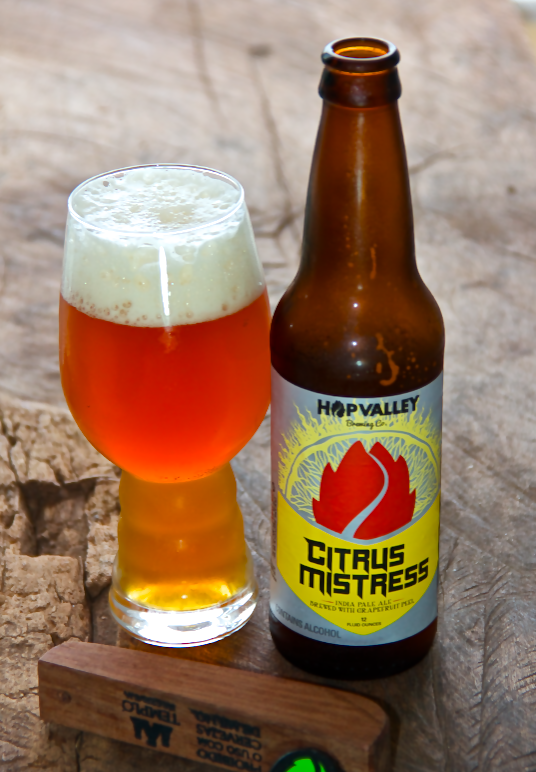 The first beer that comes to mind is Hop Valley’s CitrusMistress. Sadly this brew is a seasonal start but would be a great addition to brunch. It is made with four different hops and grapefruit peel to give a pop of citrus that will taste great with quiche or French toast- and it is even made with Munich malt to give the beer a burnt orange color so you can feel like you’re having juice. What other beverage is usually served with breakfast or brunch? That’s right: coffee. Offering a coffee stout, coffee porter or any other coffee-infused beer like a brown ale or even another dark and creamy porter like a milk or oatmeal stout will pair well with an entire brunch; and especially with sweet brunch dishes like french toast or cinnamon rolls. 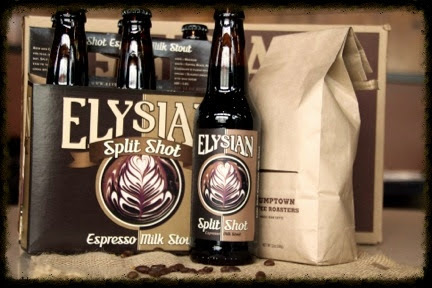 My first thoug ht on a dark beer to have with brunch is Elysian Brewing’s Split Shot Stout. This beer is brewed with Stumptown coffee and has an amazing balance of flavors. It has a great aromatic coffee smell and flavor without overpowering and finishes off clean with that distinctive smooth stout consistency. But don’t get stuck in the idea that you should only serve coffee-infused dark beers because that simply isn’t true. Deschutes Brewing Obsidian Stout would be an excellent companion with its dark malty and chocolate flavor. Embrace the cold and refreshing suds of a great craft beer at your next brunch and awaken this sometimes stuffy Sunday meal.